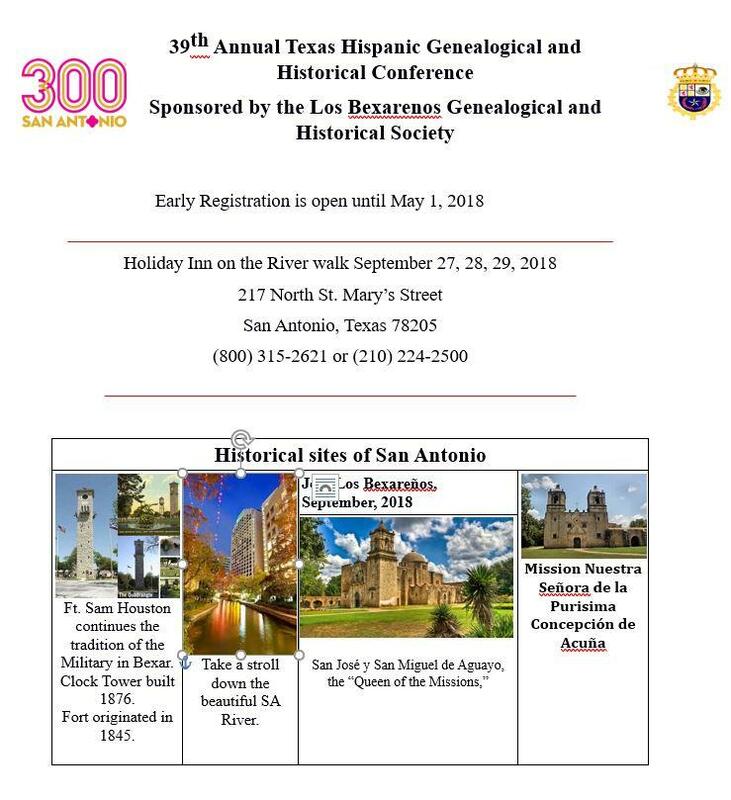 Each year, one Hispanic genealogy society, association, and or group hosts the annual Texas Hispanic Genealogical and Historical Conference. In this page you will find more information about past and future conferences. I have been fortunate enough to attend the last four held in McAllen, Laredo, Corpus Christi, and Austin Texas. It is that with the information I have obtained as an attendee and vendor that I am able to put this page together as a central page for you to be up to date and or find out more information about past speakers that have presented at these conferences. This page is a work in progress and I ask that you please book mark it for future reference. This is the flyer provided by Mary L. Reyes. If I missed a genealogy society, group or association please let me know. Also if you have photos of past conferences and or flyers or booklets about any of the prior conferences please let me know so that I can have material to create a page for each of the past conferences. This is a list of Texas Genealogy Societies, Associations, and Groups involved with the Hispanic Conference. Not currently involved but help promote the conference. Recap: The 38th Annual Conference Was Awesome! I hope that with time this page becomes the go to place to get information about past and up coming conferences. I also hope that it helps promote these conferences and that they continue to grow as they have been growing for these past three years. Please come back once a month to this page. I will be adding links and more material to this page as I obtain them.